Difference between revisions of "Prefetch"
Windows Prefetch files, introduced in [[Windows|Windows XP]], are designed to speed up the application startup process. Prefetch files contain the name of the executable, a Unicode list of DLLs used by that executable, a count of how many times the executable has been run, and a timestamp indicating the last time the program was run. Although Prefetch is present in Windows 2003, by default it is only enabled for boot prefetching. The feature is also found in [[Windows|Windows Vista]], where it has been augmented with [[SuperFetch]], [[ReadyBoot]], and [[ReadyBoost]]. For SSD drives Prefetch is disabled by default [http://blogs.msdn.com/b/e7/archive/2009/05/05/support-and-q-a-for-solid-state-drives-and.aspx]. Windows Prefetch files, introduced in [[Windows|Windows XP]], are designed to speed up the application startup process. Prefetch files contain the name of the executable, a Unicode list of DLLs used by that executable, a count of how many times the executable has been run, and a timestamp indicating the last time the program was run. Although Prefetch is present in Windows 2003, by default it is only enabled for boot prefetching. The feature is also found in [[Windows|Windows Vista]], where it has been augmented with [[SuperFetch]], [[ReadyBoot]], and [[ReadyBoost]]. Up to 128 Prefetch files are stored in the <tt>%SystemRoot%\Prefetch</tt> directory [http://blogs.msdn.com/ryanmy/archive/2005/05/25/421882.aspx]. Each file in that directory should contain the name of the application, a dash, and then an eight character hash of the location from which that application was run, and a <tt>.pf</tt> extension. The filenames should be all uppercase except for the extension. The format of hashes is not known. A sample filename for [[md5deep]] would look like: <tt>MD5DEEP.EXE-4F89AB0C.pf</tt>. If an application is run from two different locations on the drive (i.e. the user runs <tt>C:\md5deep.exe</tt> and then <tt>C:\Apps\Hashing\md5deep.exe</tt>), there will be two different prefetch files in the Prefetch folder. * [[SuperFetch]]; analyzes per-machine usage patterns over time and optimizes the data that is kept in memory. * [[ReadyBoot]]; decreases boot time (the time from turning power on to reaching the log-on screen) by preloading the files and startup programs needed per-machine into a cache. * [[ReadyBoost]]; supports the use of flash storage devices like Universal Serial Bus (USB) flash drives and Secure Digital (SD) flash cards to boost PC performance. * [[ReadyDrive]]; supports hybrid hard disk drives. Each Prefetch file has a signature in the first 8 bytes of the file. * Windows XP and Windows 2003 Prefetch file's signature is \x11\x00\x00\x00\x53\x43\x43\x41 (0x41434353 0x00000011). * Windows Vista and Windows 7 Prefetch file's signature is \x17\x00\x00\x00\x53\x43\x43\x41 (0x41434353 0x00000017). The [http://en.wikipedia.org/wiki/ASCII ASCII] representation of these bytes will display "....SCCA". A Prefetch file contains the name of the application, a dash, and then an eight character hash of the location from which that application was run, and a <tt>.pf</tt> extension. The filenames should be all uppercase except for the extension. E.g. a filename for [[md5deep]] would look like: <tt>MD5DEEP.EXE-4F89AB0C.pf</tt>. If an application is run from two different locations on the drive (i.e. the user runs <tt>C:\md5deep.exe</tt> and then <tt>C:\Apps\Hashing\md5deep.exe</tt>), there will be two different prefetch files in the Prefetch folder. According to MSDN up to 128 Prefetch files can be stored in the Prefetch directory [http://blogs.msdn.com/ryanmy/archive/2005/05/25/421882.aspx]. Both the [[NTFS]] timestamps for a Prefetch file and the timestamp embedded in each Prefetch file contain valuable information. The timestamp embedded within the Prefetch file is a 64-bit (QWORD) [http://msdn2.microsoft.com/en-us/library/ms724284.aspx FILETIME] object The creation date of the file indicates the first time the application was executed. Both the modification date of the file and the embedded timestamp indicate the last time the application was executed. Windows will store timestamps according to Windows [http://msdn.microsoft.com/en-us/library/ms724290%28VS.85%29.aspx epoch]. The creation time does not have a static offset on any Windows platform. The location of the creation time can be found using the offset 0x8 + length of Volume path offset. See section Volume for more information. * The executable's name, up to 29 characters. * The run count, or number of times the application has been run. * Volume related information, like volume path and volume serial number. * The size of the Prefetch file (sometimes referred to as end of file (EOF)). * The files and directories that were used doing the application's start-up. A timestamp of when the application was last ran is embedded into the Prefetch file. * The time when the application was last ran (executed). Version 26 of the Prefetch format maintains 7 previous last run times. * at offset 0x78 on Windows XP and Windows 2003. * The volume creation time (part of the volume information) of the volume the Prefetch file was created on. * at offset 0x80 on Windows Vista and Windows 7. In each Prefetch file, the size of the header is stored and can be found at offset 0x54 on [[Windows|Windows XP]], [[Windows|Windows Vista]], and [[Windows|Windows 7]]. The header size for [[Windows|Windows XP]] is 0x98 (152) and 0xf0 (240) on Windows Vista and Windows 7. The Prefetch file will embed the application's name into the header at offset 0x10. The run count, or number of times the application has been run, is a 4-byte (DWORD) value located at offset 0x90 from the beginning of the file on [[Windows|Windows XP]]. On [[Windows|Windows Vista]] and [[Windows|Windows 7]], the run time can be found at 0x98. Volume related information, volume path and volume serial number, are embedded into the Prefetch file. The precise offset for this information is the same for each Prefetch file and Windows operating system. In the header at offset 0x6c, the location of the volume path is stored. The location is a 4-bytes (DWORD) value. At the location given from offset 0x6c, a 4-byte value is stored which is the number of bytes from current offset (location from offset 0x6c) to the beginning of the volume path string. The location from the offset 0x6c, for ease of reading, will be called the "volume path offset." The volume path is embedded as an [http://en.wikipedia.org/wiki/UTF-16/UCS-2 UTF-16] encoded string. The length of the volume path string is a 4-byte value is located at volume path offset + 0x4. The volume [http://en.wikipedia.org/wiki/Volume_serial_number serial number] is a 4-byte value that identifies a media storage. A serial number does not have a consistent offset within a Prefetch between Windows operating systems. The 4-byte value can be found eight (8) bytes from the creation time location. The [http://en.wikipedia.org/wiki/Vol_%28command%29 vol] command on Windows can verify the volume serial number. The end of file (EOF) for each Prefetch file is located at offset 0xc. The location of EOF also denotes the size of the Prefetch file. Embedded within each Prefetch file are files and directories that were used doing the application's startup. The Prefetch file separates both filenames and directories into two different location in the file. Each string is encoded as a [http://en.wikipedia.org/wiki/UTF-16/UCS-2 UTF-16] string. Windows operating system uses UTF-16 encoding. The offset to the first set of filenames are at 0x64. The size of the first set of filenames can be found at offset 0x68. Both offsets are consistent between Windows XP, Windows Vista and Windows 7. In the bottom section of the Prefetch file are UTF-16 strings of directories. At the time of this writing (7/2011), the precise offset and size of the directory listing is unknown. The distance between the end of the Volume Path string and the beginning of the directory strings is given. An approach to finding the offset to the beginning of the directories listing is to obtain the distance value and the offset when the Volume Path string ends (after the NULL bytes). The distance value is at volume path offset + 0x18 (24). The distance is a 4-byte (DWORD) value. The end of second set of strings will complete the Prefetch file. The size of the directory listing is calculated by subtracting the start position of the directory listing from the end of file position. * [http://milo2012.wordpress.com/2009/10/19/windows-prefetch-folder-tool/ Prefetch-Tool Script] - Python looks Prefetch files up on a web server. 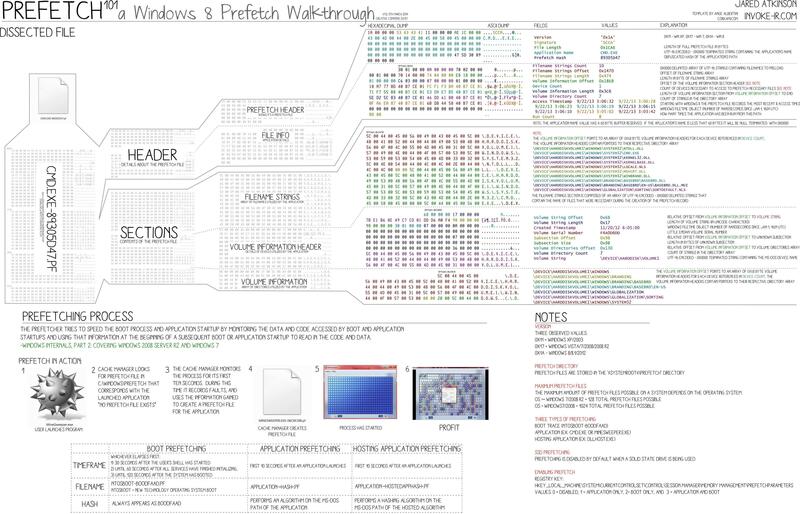 * [http://www.tzworks.net/prototype_page.php?proto_id=1 Windows Prefetch parser] Free tool that can be run on Windows, Linux or Mac OS-X. * [https://github.com/EricZimmerman/Prefetch Prefetch], Prefetch parser written in C# with support for XP through Windows 10. * [https://github.com/EricZimmerman/PECmd PECmd], Prefetch command line tool using Prefetch parser above.